I was proofreading yesterday's post before I added the picture and published it and noticed I mentioned I'm not fond of florals. I then noticed today's necktie is also a floral. Then I noticed that Monday's had a bit of flower power in the pattern as well. Must be the subconscious at work. Today's floral is a Ferrell Reed City of London. It doesn't mention anywhere on any of the labels that it's an extra long but it must be. I ended up folding the tail back on itself and pinning it just so I could get a decent knot and apron length. That's the first time I've ever done that. I had thought about wrangling it into a full fledged Windsor to soak up the extra length but decided against it since I already had on a straight collar dress shirt. 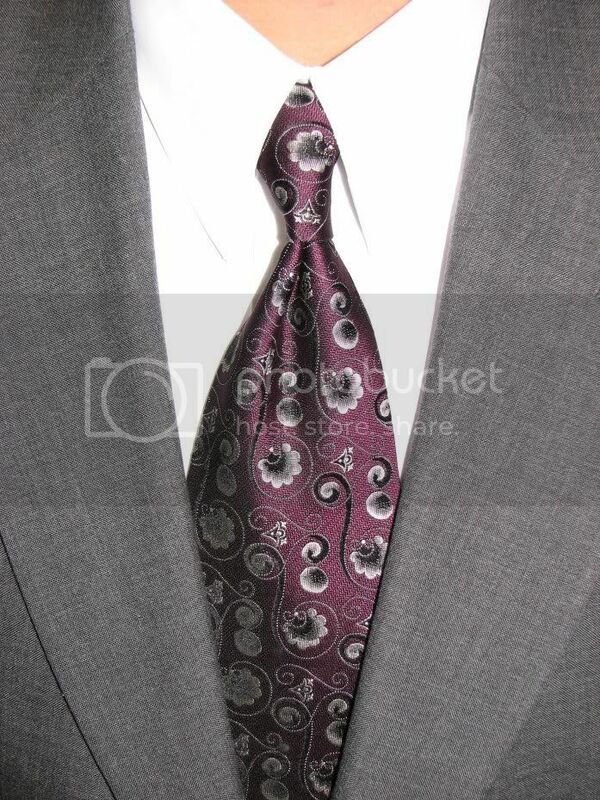 The gray sportcoat was a natural selection to conglomerate with the purple and gray in the tie. I may try the black one next time around.